"Dishonored is a bit of a surprise. It takes concepts from a few prominent games, but is distinct enough to stand-alone and even surpasses certain elements of those titles. The controls manage to put to shame years of FPS-action games, and while I found the story and immersion lacking, the gameplay in Dishonored more than made up for it." Dishonored is a bit of a surprise. It takes concepts from a few prominent games, but is distinct enough to stand-alone and even surpasses certain elements of those titles. The controls manage to put to shame years of FPS-action games, and while I found the story and immersion lacking, the gameplay in Dishonored more than made up for it. Dishonored starts with Corvo Attano, bodyguard of the empress of Gristol, returning early from a mission. Unfortunately for him, he is framed for assassinating the empress and helping to kidnap her daughter, Emily. Just before Corvo is about to be put to death for his accused crimes, he breaks out of jail and receives help from mysterious individuals claiming to believe his innocence, and wanting to help him seek revenge. Though the story has some initial promise, it fell short and eventually just sputtered obvious plot twists and predictable secrets. That being said, the world of Dishonored is incredible. Perching on the rooftops gave me a perfect view of this broken down, dystopian society. The rat-infested city of Dunwall, which was based off 19th century London, is beautiful in a gloomy sort of way. Inhabiting the world is rich bureaucrats, oppressive solders, downtrodden citizens and weepers – who are zombie-like plague victims. Each echelon has its own gems of interesting people, however, the majority of people encountered in Dishonored will repeat lines like a broken record. Every guard seems to be having the same girl troubles and hankering for cigars. Overall, this was forgivable because of how well the surroundings conveyed the depressing mood of this society, even if the occupants didn’t. Arkane Studios also took the time to populate Dishonored’s world with a multitude of books, notes and audio-diaries for key figures – which are very similar to the ancillary information found in games like BioShock or Skyrim. All of these build the world into something more tangible, but the execution doesn’t work. Admittedly, the books are shorter and more digestible than the literature found in Skyrim, but stopping to read the books or listen to the diaries requires just that – stopping. It breaks the flow of the game, and it’s too tempting to skip over text instead of experience the world in full. BioShock got this right with the audiologs, and Dishonored should have implemented a similar system. One aspect that Arkane Studios executed perfectly is how Dishonored plays. Dishonored’s controls are as fluid and responsive as games get. 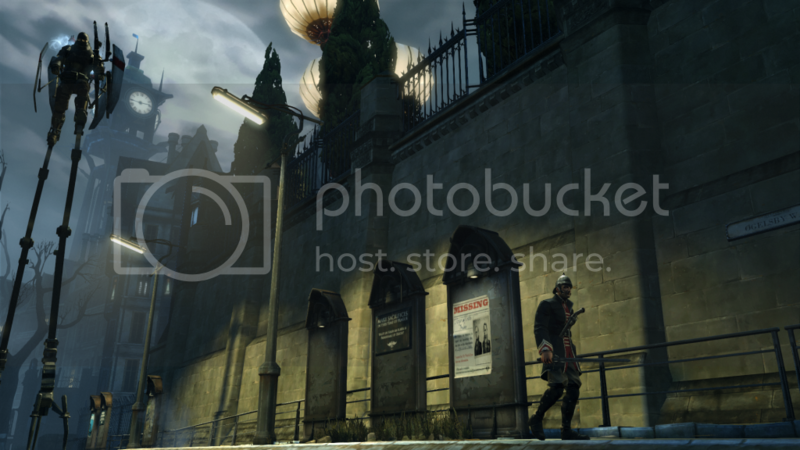 Arkane Studios has set the new bar for FPS controls with Dishonored. Running, jumping, diving, climbing, ducking under a table – they all feel so natural. Much like in BioShock 2, Dishonored employs a dual wielding combat style. Corvo’s right hand will always be holding a blade, but the left is free for players to pick between a variety of spells, gadgets and weapons. This allows for some truly entertaining moments. 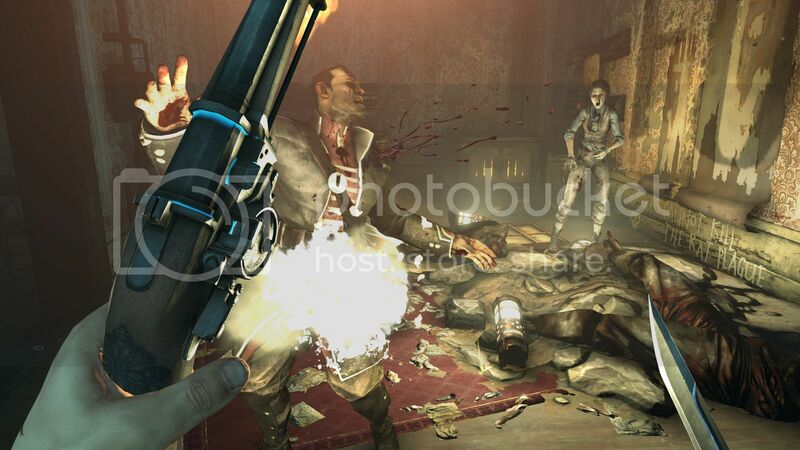 Maneuvering enemies in front of their own bullets, surprisingly them by summoning a horde of rats and the numerous other ways to deal with opponents kept Dishonored from becoming dull. Toward the end, after your weapons and abilities have been upgraded, stealth can be ditched in lieu of running around as the juggernaut killing-machine the game has crafted you into. Early on, however, the key is to remain unseen. Corvo might be an ex-royal bodyguard, but when swarmed by enemies he will die quickly. This isn’t Assassins Creed where the enemies will politely line up and attack you one at a time. Instead they will sneak behind you, or sometimes even shoot through their comrades. Likewise, Corvo can’t dive into a wheelbarrow of straw until enemies lose interest. Once alerted, they won’t quit their hunt until they’ve found you. This is why emphasis on stealth is important. Avoiding conflict can save you time and frustrating restarts. Though, as far as restarts go, Dishonored is pretty generous. There is no penalty for dying besides waiting for the game to reset itself and putting you through the loading screen, and I often used this as an opportunity to test different tactics. Dishonored is not a puzzle game per se, but many situations call for problem solving from multiple angles. At several times, I found myself in a death-restart loop, which seemed endless and unsolvable, only to find that choosing to explore the area opened up far easier means to completing an objective. This sense of choice is a reoccurring theme in Dishonored’s gameplay. The game can be played by violently painting the ground with others blood, or you can choose to not kill a single person. The choice to kill or not is also interwoven into the story. Much like Deus Ex, you have a choice during your missions that directly affects the story and auxiliary characters’ mentalities. Completing side missions can open up alternatives to violence and send you home early. These different routes provide different endings to the game, but whether you choose to kill or not, Dishonored plays out very similarly. Despite some letdowns, Dishonored manages to still be a good game. The lacking story is easily overshadowed by the compelling world and addictive gameplay. And while it may have borrowed some concepts from other noteworthy titles, I expect games will be borrowing from Dishonored soon enough. If you enjoyed this Dishonored review, you're encouraged to discuss it with the author and with other members of the site's community. If you don't already have an HonestGamers account, you can sign up for one in a snap. Thank you for reading! None of the material contained within this site may be reproduced in any conceivable fashion without permission from the author(s) of said material. This site is not sponsored or endorsed by Nintendo, Sega, Sony, Microsoft, or any other such party. Dishonored is a registered trademark of its copyright holder. 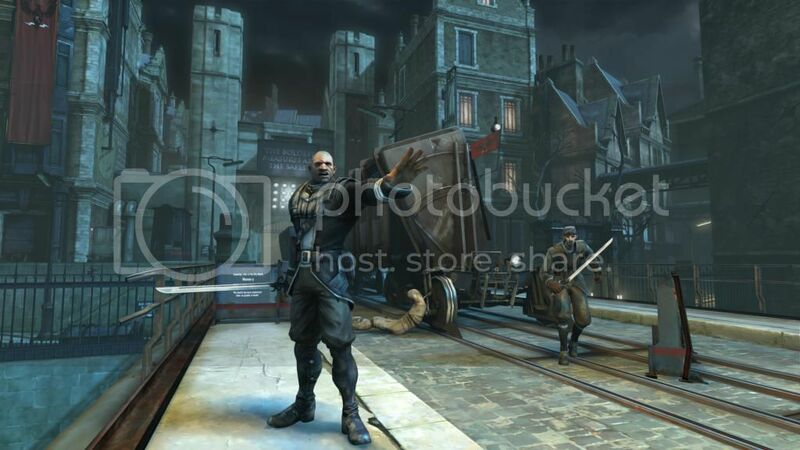 This site makes no claim to Dishonored, its characters, screenshots, artwork, music, or any intellectual property contained within. Opinions expressed on this site do not necessarily represent the opinion of site staff or sponsors. Staff and freelance reviews are typically written based on time spent with a retail review copy or review key for the game that is provided by its publisher.